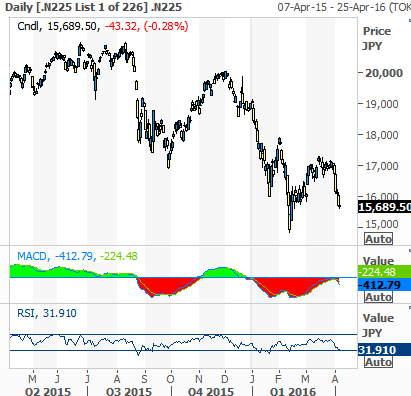 Wednesday 6th April-Australian Market Wrap | Beeks Downunder-Because not all financial news is boring! ASX 200 seesaws around on low volume to close up 21.5 points at 4945.9 as energy stocks help but once again banks weigh. Chinese PMI numbers lifted sentiment but the rally faded before a strong touch up on the close. Japan once again down 0.14% and China 0.57% at lunch. 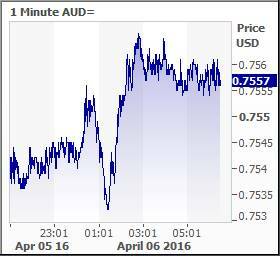 AUD slips back to 75.57 cents with US Futures +61. 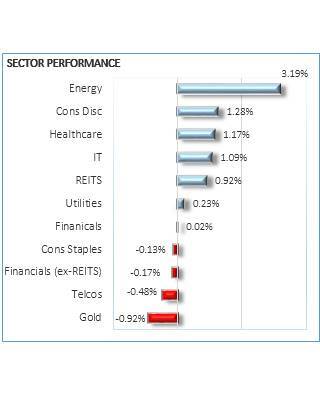 A strange day as energy and material stocks outperformed the banking sector. After a positive start bucking the US trend, we fell in a heap to test the 4900 level bottoming at 4906 before better Chinese data kicked us higher although banks failed to respond. As the afternoon wore on so the enthusiasm wore off and we needed a rush of blood to the head on the match out to save our blushes. In the final wash up we managed a 21.5 move to 4945.9. Unconvincing but we will take it. The PM was blowing out candles for Westpac Bank’s 199th birthday and issued a very thinly disguised warning that banks need to do the right thing by their customers. The recent move by ASIC on Westpac will not be the last by any means and the sector will continue to trade under a cloud. We may get some clarity from the banks in May as they hand down their results. All have new management teams so there could be a move to be dramatic with provisions and wipe the slate clean. The market may take some comfort from that and then adjust to the new environment. 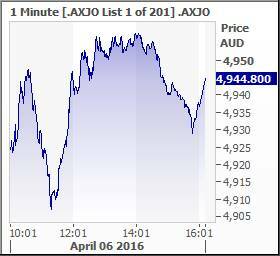 The resource stocks perked up on a lower AUD following yesterdays’ comments with an especial focus on oil and gas. The market had a low of 4906 and a high of 4958 with volume once again on the low side. 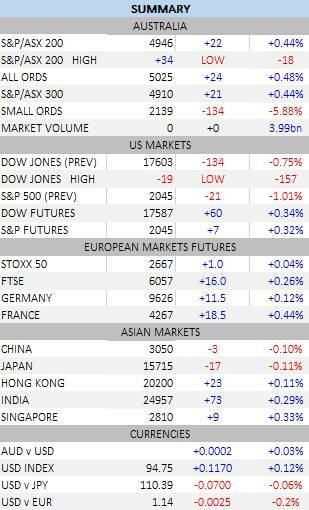 We do seem to be setting the tone for global markets at the moment and our relative strength will see European and US markets ahead tonight. US results season kicks off next week with nothing brilliant expected at all. 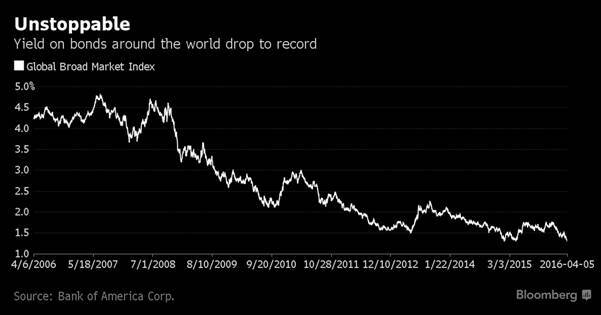 Global bond yields at record lows of 1.3%. Resources were again a bright spot with BHP +1.0%, RIO +0.91% and Fortescue Metals (FMG) +2.36% on record shipments out of Port Headland, and a stable iron ore price. Base metals stocks also improved as the AUD fell away. South 32 (S32) +4.36%, BlueScope Steel (BSL) +1.5%, Oz Minerals (OZL) +3.19% and Independence Group (IGO) +1.85%. Golds were mixed after a weaker start with St Barbara (SBM) +2.35% and Anglo Ashanti (AGG) +3.24% whilst Newcrest (NCM) -1.36% and Evolution Mining (EVN) -2.9%. 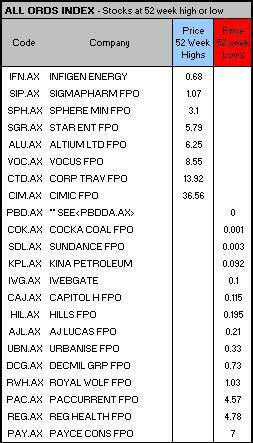 Energy stocks were the stars today which was about time. Oil Search (OSH) +5.29%, Woodside (WPL) +2.84% Santos (STO) +3.94% and Caltex (CTX) +3.07%. Worley Parsons (WOR) +5.08% also feeling the love on higher crude following Kuwaiti comments. 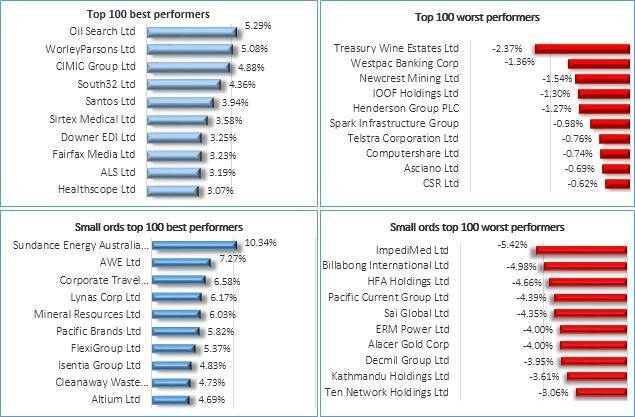 Financials better in places like Challenger (CGF) +3.06% and OzForex (OFX) +3.92% but banks not so happy. Birthday boys Westpac (WBC) -1.54% the weakest with Australia and New Zealand Bank (ANZ) +0.36% outperforming after their dog days recently. Industrials mixed Cimic (CIM) +4.88% a winner, health stocks improved led by Fisher and Paykel (FPH) +2.32% and CSL +0.97%. Technology stocks back in demand with Altium (ALU) +4.69%, iSentia (ISD) +4.83% and even 1PG (1PG) +10.26% rallying off its lows. Media tried to recover after the ‘surprise’ from Nine Entertainment (NEC) +2.16% yesterday. There are a lot of analysts that have massively reduced their price targets yet still have a buy in the stock. Plenty of collective egg on their faces. But digital media continues to find favour Ooh!Media (OML) +4.44% and APN Outdoor (APO) +1.62%. Free to air continues to suffer. TEN –3.06% seriously, Seven West Media (SWM) +1.12% recovering. Speculative stocks of the day: Silver City Minerals (SCI) +60% following commencement of RAB drilling at the zinc rich targets in Broken Hill. Corporate Travel Management (CTD) +6.58% has combined with the Coles Flybuys loyalty scheme to develop a new online booking site, ’flybuys travel’. The company has not updated its full-year guidance for $68 million of underlying EBITDA as a result of the flybuys deal. If the guidance is met, its EBITDA will have risen by 67%from the prior year. Chalmers (CHR) +4.3% not one that gets a mention very often is quietly being stalked by trucker Lindsay Fox as he has moved to a holding of 17% of the company. This one is set to run longer than Asciano but Spanish infrastructure group Ferrovial has raised its hostile takeover bid for Broadspectrum (BRS) +2.4% by 15¢ to $1.50 per share and declared the revised $813 million offer final, putting pressure on investors to accept the bid or risk a fall in the contractor’s share price. Broadspectrum’s board immediately rejected the new offer, and told shareholders to take no action. Arrium (ARI) in a trading halt as behind the scenes machinations looked for a solution to a company with over $2bn of debt and nowhere to run to. The banks have knocked back the proposal from the US vulture fund and are now scrambling to come up with an alternative. The local banks are on the hook for around $1bn. Telstra (TLS) -0.76% after Optus announced new deals on its mobile plans with a customer getting a month free if they sign for two years. ‘Vodafail’ has a similar deal that it brought in during March. The competition is heating up after the recent outages from Telstra. Bad news for Chevron and their Gorgon project as a mechanical issue will delay production by 30-60 days. Chevron is operator and majority owner of the Gorgon project, with Exxon Mobil Corp and Royal Dutch Shell each holding 25 per cent stakes. Bellamy’s (BAL) -2.48% failed to impress at a Dairy Day presentation. Finally tried a bounce out of Japan today after a slippery slide down but it seemed unable to stick and as we closed the Nikkei was back in the red -0.35%. China too dissolved into the red after better PMI numbers today. Not been much fun in the Nikkei recently as the soaring yen defies logic of negative rates. The forecast was for around 49.3 and the first time above 50 since July. Pfizer has announced that its mega merger with Allergan is off. This was US$160bn deal which will leave a lot of Investment bankers and lawyers crying into their caviar and smoked salmon. The US Treasury has moved to put an end to so called inversion deals where a takeover allows a company to rebase its tax base and gain a foreign address. Pfizer has to pay Allergan a US$400m break fee so it is not all bad news. The Treasury Department said Monday that new rules would limit companies’ ability to participate in inversion transactions if they’ve already done them within the past 36 months. In the US Election, the Trump train ground to a halt last night in Wisconsin as Ted Cruz wrestled back the state. Should make an interesting convention. In the US Ford Motor Cars will be in for a tough ride trying to justify their US$1.6bn investment in car manufacturing in Mexico. Banks in the spotlight in the UK with the trial of Barclay’s traders in session for interest rate fixing. It is expected to last three months.